A massive nor'easter pummeling the East Coast is responsible for at least seven deaths. The storm strengthened rapidly Friday, undergoing what's known as bombogenesis or "bombing out," when a low-pressure system drops 24 millibars in 24 hours. Dubbed a "bomb cyclone," the catchphrase was coined earlier this year as a nickname for another nor'easter back in early January. At least seven people have died in the storm -- all killed by falling trees. A 6-year-old boy died in Virginia after a tree fell on his family's home, officials said. Others include an 11-year-old boy hit by a falling tree in New York state, a 57-year-old man in Upper Merion, Pennsylvania, hit by a tree while in his car and a 77-year-old woman struck by a branch outside her home in Baltimore. Heavy snow fell across much of the interior northeast Friday afternoon, including in Syracuse and Albany, New York; New Jersey and eastern Pennsylvania. Sussex County, New Jersey, has already seen 10 inches of snow by the afternoon. New York City saw a mix of rain, snow, sleet and winds that wrapped up by evening. Over 4 inches of rain fell in eastern Long Island and parts of eastern Massachusetts. 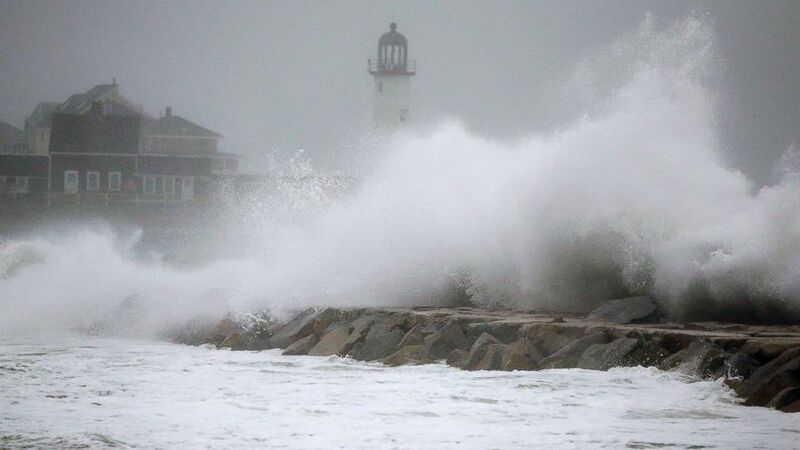 Connecticut and Boston were hit with heavy rain, flooding and whipping winds. Boston, especially, saw heavy coastal flooding late Friday. The highest wind gust was 93 mph in Barnstable, Massachuetts, while an 83 mph gust was measured in both East Falmouth, Massachusetts, and Little Compton, Rhode Island. Hurricane-force wind gusts will continue through coastal Massachusetts and Rhode Island Friday night. High wind warnings remain in effect with gusts from 50 to at least 65 mph from the Carolinas to Massachusetts. Over 2.2 million customers were without power across the Northeast early Friday evening, but power was restored to more than two-thirds of those customers by 9:30 p.m., leaving just over 700,000 customers still in the dark. In Pennsylvania, a school bus was toppled over by high winds. No students were on board, and the driver's injuries were minor. In Suitland, Maryland, 300 people were displaced after an apartment building partially collapsed, according to WUSA. A tractor-trailer overturned on the Verrazano-Narrows Bridge in New York, photos showed. In Washington, D.C., winds reached 71 mph at Dulles Airport and 62 mph at Reagan International Airport. Prince William County Public Schools in the Washington, D.C., area were closed Friday due to high wind warnings. The federal government also shuttered all of its offices. Over 4,000 flights were canceled in the United States Friday, according to FlightAware. Nearly half of all scheduled flights at New York City's LaGuardia Airport have been canceled today, the airport said. LaGuardia, Logan International in Boston and Newark Liberty International in New Jersey were the top-3 airports for cancelled flights on Friday. Amtrak temporarily suspended service along the Northeast corridor until Saturday due to what it termed were "hazardous conditions for our customers and crews." They announced around midnight Saturday that modified service would resume between Washington, D.C. and New York City at 6:20 a.m. and between New York City and Boston at 8:40 a.m.
Coastal flood alerts are in effect from Maryland to Maine, with major and possibly record coastal flooding expected in the Boston area Friday night into Saturday. The third highest tide on record happened today at Boston Harbor, reaching 14.67 feet. "Do not try to drive through the water!" the Duxbury Fire Department in Massachusetts said. "I can't stress this enough: This is not a snowstorm, but it's a heck of a storm and people need to take it seriously," Massachusetts Gov. Charlie Baker said at a news conference Thursday night. Blizzard warnings were issued for parts of upstate New York, which saw 50 mph winds, whiteout conditions, and an additional foot of snow Friday afternoon. Parts of New York, Pennsylvania and northwest New Jersey were likely to see 1 to 2 feet of snow through Friday evening. By Friday night the nor'easter had pulled away, leaving lingering rain and snow for coastal spots from Atlantic City to Boston. By early Saturday morning, the region will be much drier, but the threat of winds and coastal flooding will remain into mid-day Saturday.